It is possible to have an approved, judged iris show at your school with the help of your sponsoring iris club. But an informal, unofficial classroom show is fun and requires less work. The needed Equipment is listed below and a picture of the Entry tags (to the left below). Ribbons, Blue = 1st, red = 2nd, white = 3rd, pink = Honorable Mention medium purple = Best of Section, and the large purples = Best of Show. Make these from paper and string. Fill containers with water. Students should carefully cut iris stalks at ground level and place in a container. Discard bottom leaves. Carry bottle inside. Wedge carpet padding in top of container so stalk stand straight. Groom iris. Remove dirt and insects using Q-tip or brush. Carefully remove any spent blooms and trim brown leaf tips. Use a Q-tip to wipe off fingerprints from the stalk. Fill out entry tag and place it on the container with a rubber band. Place irises on table in alphabetical order. Group into tall bearded, median, beardless, species, etc. 15 - 25 stalks would make a good show. A student may enter several stalks but only "1" of each named variety. Choose 3 students to be judges and 2 students to be clerks. Judges may not touch entries but clerks may turn containers so judges can see all sides of the iris. Clerks do not speak unless asked. One clerk punches entry tag and the other places ribbons over entry tags as directed by judges. Irises are judged in order with judges taking turns speaking. Any number of blue ribbons may be awarded, but only one to each named variety. After all stalks are judged, pick best of each section (issue medium purple ribbons). 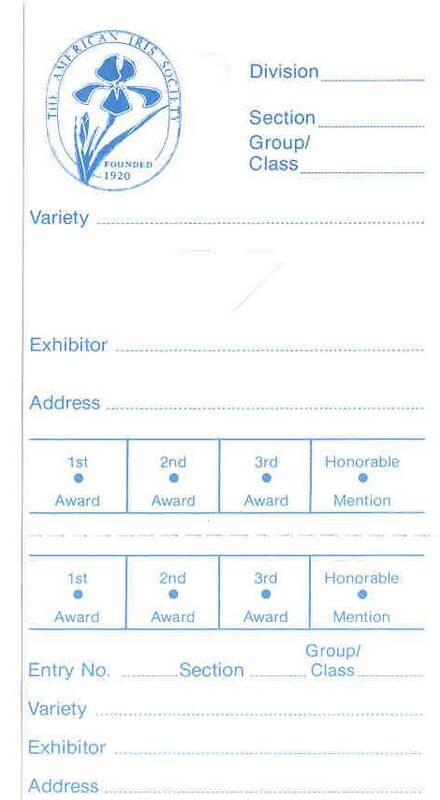 After all section awards are decided, choose best of show (issue large purple ribbon). When judging is complete, invite guests to see the iris show.